TINA PRO is a powerful yet affordable software package for designing, simulating, and analyzing analog, digital and mixed electronic circuits. Analysis results can be displayed as sophisticated diagrams or on a range of virtual instruments. Comprehensive DTP tools can be used to produce professional reports and presentations. Electrical engineers will find TINA an easy to use, and high performance tool, while educators will welcome its unique features for the training environment. Enter any circuit within minutes with TINA's easy-to-use schematic editor. Choose components from the large library containing more than 10,000 parts and manufacturer models. Analyze your circuit through more than 20 different analysis modes or with 7 high tech virtual instruments, and export the design to your favorite PCB package when ready. 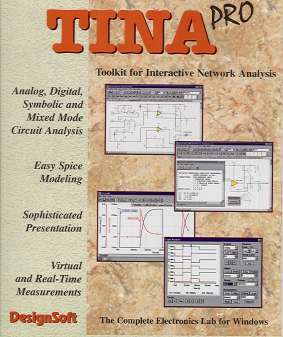 Present your results in TINA's sophisticated diagram windows, on virtual instruments, or in the live interactive mode where you can even edit your circuit during operation. Make stand-out reports and presentations of schematic diagrams, annotations, formulas provided by symbolic analysis, Bode plots, Nyquist diagrams, poles and zeros, transient responses, digital waveforms, and other data using linear or logarithmic scales. Customize presentations using TINA's advanced drawing tools to control text, fonts, axes, line width, color and layout. You can create, edit and print documents directly inside TINA or cut & paste your results into your favorite word processing or DTP package. Create new TINA components from any Spice subcircuit, whether created by yourself, downloaded from the Internet, obtained from a manufacturer's CD or from portions of schematics turned into subcircuits. TINA automatically represents these subcircuits as a rectangular block, but you can create any shape you like with TINA's Schematic Symbol Editor. You can also use TINA's parameter extractor program to calculate model parameters from catalog or measurement data and then add the new devices into the catalog. TINA also includes unique tools for testing students' knowledge, monitoring progress and introducing troubleshooting techniques. With optional hardware it can be used to test real circuits for comparison with the results obtained from simulation.